lemon | "blackberry-eating in late September"
This world in the last few weeks has been a place of heartbreak and confusion and frustration and terror. I was bewildered, and angry, and I grieved, and I wrote and deleted various posts on various platforms that felt too tidy, and too ineffectual. But amidst the heartbreak, and the anger, and the mistakes, there were these moments of strength and of recovery and of determination: one of my students, wearing a t-shirt that said “Caution: educated student of color.” I wanted to hug him. I wanted to say “great shirt.” I wanted to tell him to keep wearing it so proudly and to use that power and that dangerous-in-a-good way truth about himself to help change happen. I just smiled as he sat down at his desk. A sold-out message on every single one of the shirts bearing an excerpt from Lin-Manuel Miranda’s Tony award acceptance sonnet, which were being sold to raise funds for victims of the Orlando shooting. As a friend of a friend commented, agree with their objective or not, and whether their actions and their words were successful or not, the filibuster in the Senate and the sit-in in the House were pretty inspirational. Determination. Strength. Flashes of brightness and connection in an increasingly isolating world. At first, because there was too much of the world in my brain with all of this going on, I couldn’t think of anything to make. As always, food seemed too trivial to worry about, and perhaps it is. But it is a comfort. Stumbling all unwilling into the kitchen was a chore, until I picked up a knife, and a whisk, and the familiar enfolded me. 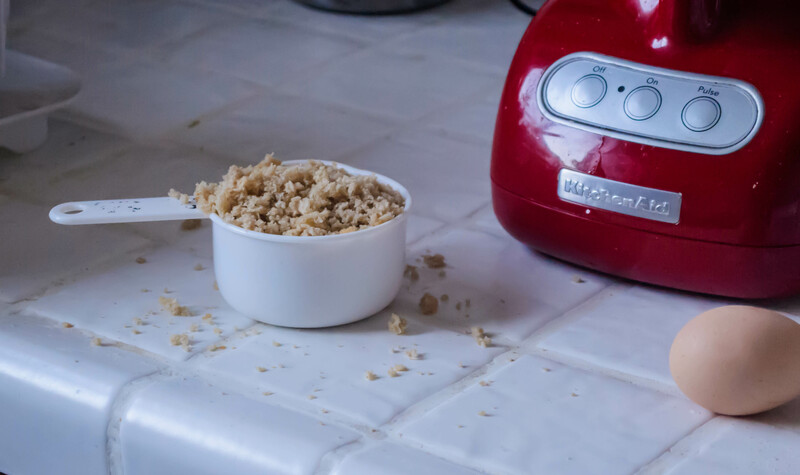 Perhaps because it was the first kind of cooking I learned to do, standing beside my mom, scooping or mixing or poking at cookies, baking seemed like the right way in. Then, inspired both by N’s recent snack preferences at a certain coffee corporation, and a gorgeous picture on King Arthur Flour’s instagram feed, I knew the answer was pound cake. In a way, it works with my tangled feelings: it’s a dense cake, weighty and substantial and thick, but shot through with lemon zest and topped with a drizzle that becomes crunchy and tart as it bakes it has those flashes of brightness I’m looking for and lifted by. KAF’s version incorporates some cream cheese along with all that butter, which I like for the barely discernible tang it promises. You don’t need a lot to pair with pound cake; in fact, its very title suggests you need nothing, but I couldn’t resist a bit of excess. Bright, meaty, fuzz laden apricots, pitted and sliced into wedges, and a heaping dollop of barely sweetened whipped ricotta, lightened with cream, make the utilitarian slice a rich-but-not-too-heavy dessert. I wish you some comfort this week, and I hope you have something safe and solid in your life, and some flashes of brightness to turn your face toward. Preheat the oven to 350F and lightly grease a 9×5 inch bread pan. KAF is very specific about the measurements of the pan; otherwise you might get batter overflow. In a mixing bowl (I used the bowl of my stand mixer), beat together the butter and cream cheese until well combined with no obvious lumps. Room temperature fats here will incorporate more quickly. 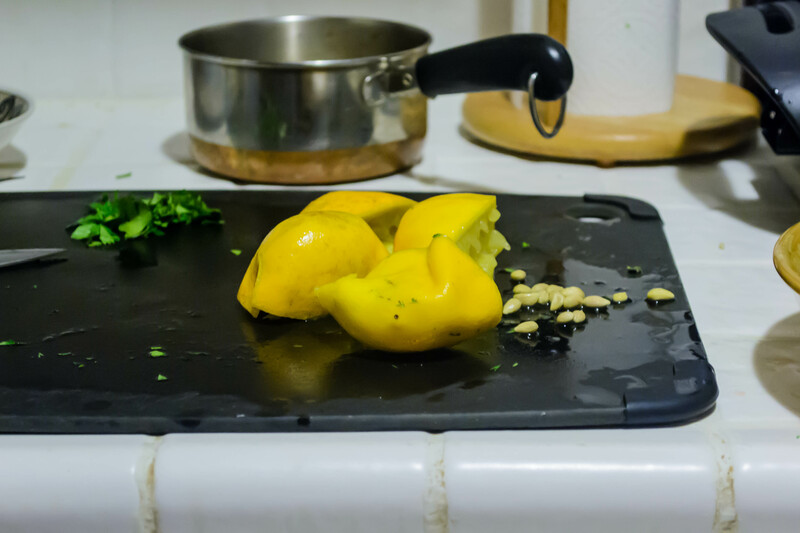 Rub together the lemon zest and 1½ cups of the sugar with your fingertips. This evenly distributes the zest and encourages it to release its oils, which are what give it that heady, perfumed flavor. Add the zest and sugar to the butter and cream cheese mixture and cream on medium-low or medium speed for about 1 minute, or until the mixture is pale and fluffy. Add the baking powder, salt, and vanilla to the creamed butter and sugar and beat briefly to combine. Then, with the mixer running on low, begin to add the eggs one at time, mixing well between each addition. When the eggs are all integrated, add the milk and beat on high speed for 2-3 minutes until the mixture is light and fluffy. KAF notes the mixture may look curdled or grainy as you add the eggs; mine didn’t, though it did look a little grainy after I mixed the milk in. Either way, it’s nothing to worry about. Now, sprinkle the flour gradually over the batter with the mixer running, and mix on low speed just until combined. Pour and scrape into the prepared pan, using a spatula to smooth the top. Set the cake on a baking sheet for easy handling and in case of overflow, and stow in the preheated oven for 55 minutes. While the cake bakes, combine the remaining 2 tablespoons sugar and the 2 teaspoons lemon juice in a small bowl, stirring until it reluctantly comes together into a thick syrup. After the cake has cooked for 55 minutes, remove it from the oven on its pan and brush or drizzle the sugar and lemon juice mixture over the top (you may need to re-stir the lemon juice and sugar mixture just before using it). Return the cake to the oven for another 15-20 minutes, or until a toothpick or cake tester comes out clean, or an instant-read thermometer inserted deep into the center reads 200-205F (as KAF notes, there may still be a touch of gooiness to the very top crown where the cake has split; don’t worry about this). Cool the cake on a rack in its pan for at least five minutes, then turn out of the pan and rest on the rack until it is completely cooled. About 20 minutes before you are ready to serve the cake, place a metal bowl and beaters or whisk attachment into the freezer. This helps the cream whip up faster. While they cool, pit the apricots and cut them into thick wedges. Once the bowl and beaters are cold, add the heavy cream and ricotta to the bowl and begin to mix on low speed. Sprinkle in the sugar and, as you see the mixture thicken, raise the speed to medium. Whip at medium speed until the ricotta cream has thickened to your desired consistency; probably 2-3 minutes if you started with cold equipment. To serve, cut the cake into thick slices, and serve one slice topped with a few wedges of apricot, a dollop of whipped ricotta cream, and a few strands of lemon zest, if desired. I’m sure you’ve been waiting with bated breath for this post. I’ve made you yearn for it for half the month already! But I didn’t want to announce my intent without something to show for it, and now I finally have a triumphant opening act. Can I get a drumroll? The project I’ve decided on for 2015 is…. meatballs. Meatballs appear in almost every culture. Albondigas find their way into soup in Hispanic cooking. Chinese meatballs are often steamed or boiled. 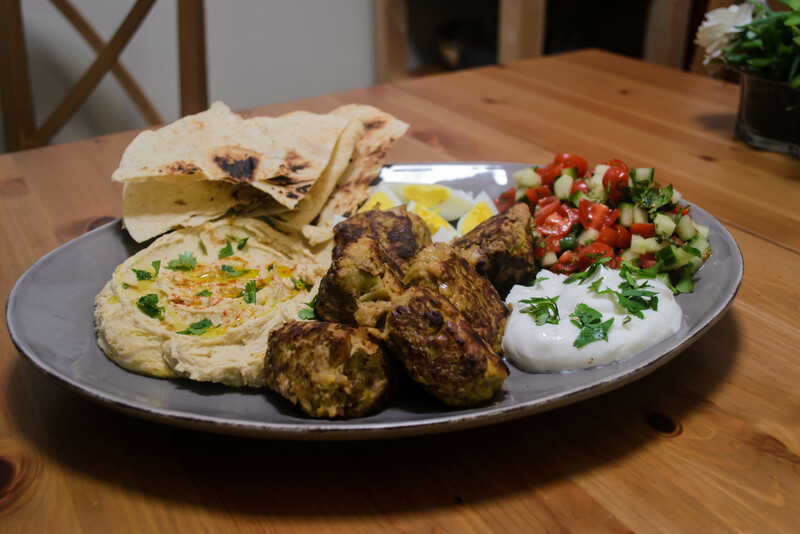 Keftedes are Greek, kofta or kufteh appear in Middle Eastern dishes. A Swedish version coats very small rounds with a sumptuous gravy and serves them with potatoes and lingonberry jam. The classic American meatball, which is in fact of Italian origin, nestles amidst a mound of well-sauced pasta. But they aren’t just, as the name suggests, balls of meat. Many meatball recipes combine different types of ground meat to maximize flavor but also adjust fat content. Very lean ground meats, like veal, which some meatball preparations use for its flavor, are often combined with something like pork or fattier beef to ensure tenderness and structural integrity. Bread in some form, whether dry and powdered or fresh, springy crumbs, is a frequent ingredient in a meatball. Though this could be to stretch the meat content (think bread crumbs as “filler” in a crab cake), it also absorbs fat and creates a lighter final product – “light” meatballs are often texturally prized above the dense thickness of a meatloaf, for example. Most meatball recipes also incorporate some sort of aromatics, and sometimes eggs, to the mixture. This isn’t a mere unflattened hamburger; it’s a creation unto itself, and it needs some backup singers to really make the performance impressive. Onions or garlic, sweated or sautéed before incorporating, are common additions. Herbs, parsley perhaps the most common, are also frequent meatball interlopers. In deciding on meatballs as my project for the year, I am challenging myself with ratios and with flavor combinations. Ratio-wise, the quantities of meat to bread crumbs to eggs to seasoning must be considered; I want a meatball with good structural integrity – it can’t fall apart during cooking – but I also want something light and springy, not tough and dense. Thus quantities, but also mixing and cooking techniques, must be mastered. As for flavor combinations, this isn’t a dish where you can taste a little at a time. It’s not a slice of roast pork that you can eat with or without the vegetable side. Everything in that little sphere must mingle well. Every ingredient must belong, with nothing extra and nothing missing. I must admit that I am not a huge fan of the most common meatball incarnation in this country. The planet-sized spheres that arrive, drowning in marinara, balanced uneasily atop a plate of spaghetti, have never thrilled me. But outside that standard, pasta-draped option, I love a good meatball. I hope you do too. So here’s the challenge: once a month, I will present you a meatball recipe. I have some ideas already, but I’m starting myself out gently with a few recipe adaptations before I strike out into unpracticed territory. And if you have any meatball ideas you’d like to see actualized, let me know in the comments or send me an email! I’ll happily cook something up. For the opening act, I looked no further than Yotam Ottolenghi and Sami Tamimi in their stellar cookbook Jerusalem. I love this volume. When I bought it for myself last year, I gave up marking recipes I wanted to try with a post-it note because, let’s face it, that’s just not helpful when you are marking almost every page. 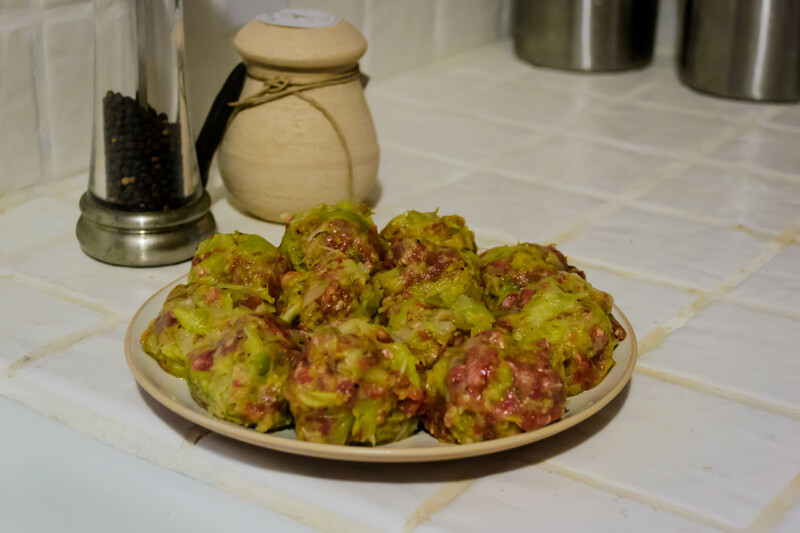 But the Lemony Leek Meatballs, curiously filed in the vegetable section, stood out. First of all, as Ottolenghi and Tamimi note, they are packed with a staggering quantity of leeks which, despite the beef that makes up the “meat” component, really do emerge as stars in the dish. Secondly, the sauce, chicken broth spiked with a tremendous dose of lemon juice, sounded so bright and aggressive with flavor that I just wanted to drink a mugful. I wasn’t disappointed. The meatballs sear up golden and aromatic, and as they simmer in the sauce they soak up its acidity and turn it into something outrageous – an intensely savory lemon caramel coating around fragrant pyramids (mine wouldn’t stay round). 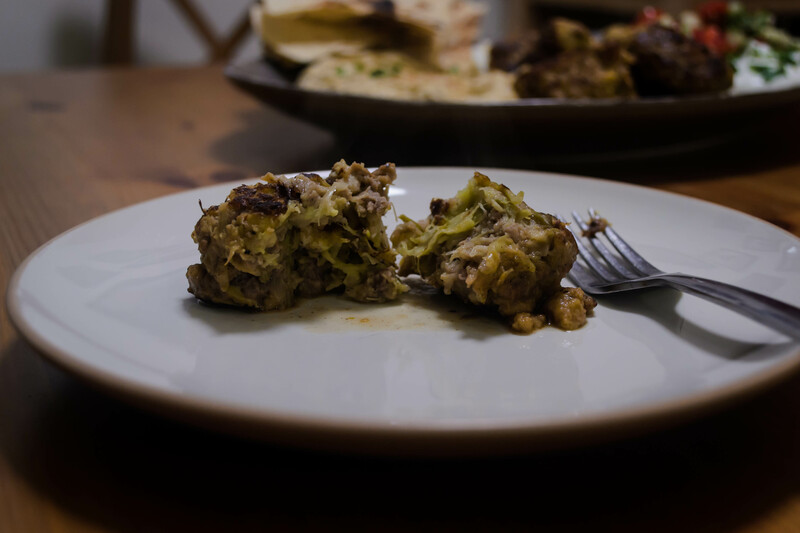 The leeks and beef are a stellar combination, and the addition of fresh bread crumbs as well as the gently pulverized leeks keep the meatballs light and fresh, probably why they are classified as an appetizer or starter in Jerusalem. I’ve made a few changes from the original, a dicey business with beloved traditional recipes like many of these, but they are minor. Rather than steaming the leeks, I’ve sautéed them gently in a mixture of butter and olive oil for extra flavor. To keep with my project theme, I’ve maintained the ball shape, rather than flattening them into patties as Ottolenghi and Tamimi direct. Finally, as I’ve noted below, I increased the number of meatballs – rather than 8, as in the original recipe, I’ve done 12, and really you could easily make 16 from the same amount of mixture. Forewarning: this is a lengthy process. Like, if you are really on top of your game and quick on the prep and ready to multitask, “lengthy” means about two hours. 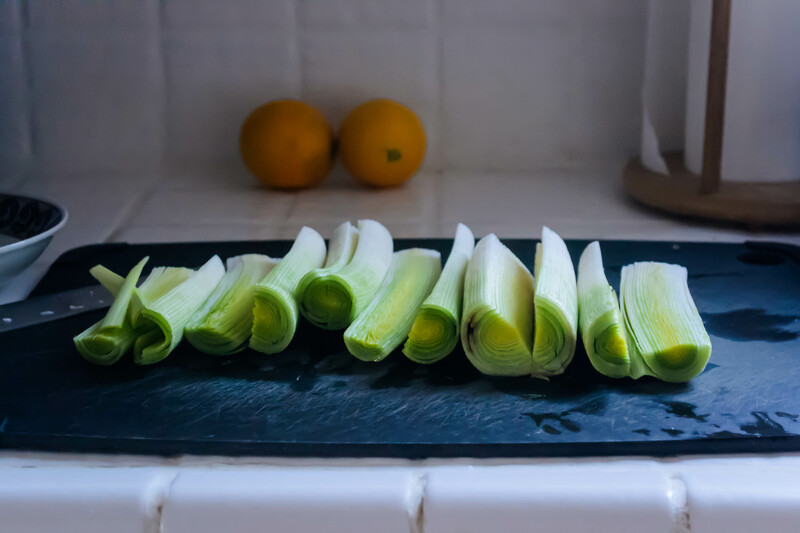 The leeks must be cooked down first, which takes a good 20 minutes, and then cooled. The meat mixture, once it’s formed into balls, must be chilled for a full half hour to ensure that they stay together in the pan. After searing, the meatballs simmer in the rich, tart broth for another half hour, and then must cool a bit, as they taste better just warm or at room temperature than scaldingly hot out of the pan. All this means you are looking at almost two hours of prep and cooking time – not onerous, particularly because half an hour of that is just cooling your heels while your meatballs do the same, but worth noting before you charge in hoping to have dinner on the table in the blink of an eye. Serving suggestions: tuck them into warm pita or naan with the yogurt and perhaps a few slices of cucumber, or sit them on a bed of fragrant couscous shot through with toasted nuts and green onions, or maybe some finely chopped dried apricots. Add a sprinkle of good, tart feta to the top for some extra zing. Slice the trimmed leeks in half lengthwise to form long half-cylinders. Rinse well, being sure the water gets in between the layers, where dirt can be hidden. Shake off and slice across into ¾ inch slices. Heat 1 tablespoon butter and 1 tablespoon olive oil in a 12-inch skillet over medium heat. Add the leeks and ½ teaspoon salt, and clamp on the lid. Cook, stirring occasionally, for 20 minutes, until the leeks are completely tender but not browned. Drain leeks in a colander, pushing them against the sides with the flat of a wooden spoon to press out some of the water. Leave to cool, then squeeze out any residual water with a clean kitchen towel. Dump leeks into a food processor and pulse a few times until well chopped, but not mush. 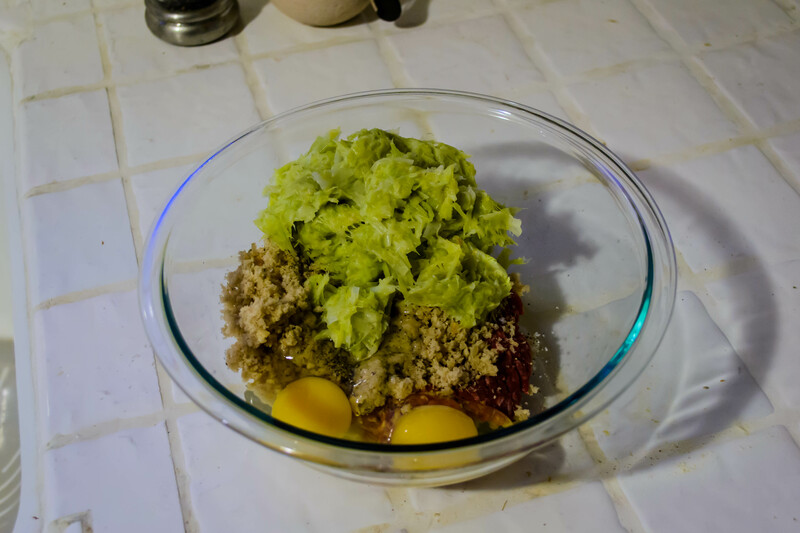 Place them in a large bowl with the ground beef, bread crumbs, eggs, 1 teaspoon of salt, 1 teaspoon of black pepper, and use your fingertips to gently combine the ingredients into a homogenous mix. Try not to overwork. The final mixture will be quite soft. Gently form the mix into 12-16 equal balls and refrigerate 30 minutes (this gives the bread crumbs some time to absorb some of the fat and liquid in the mixture, and helps these delicate, soft meatballs stay together). 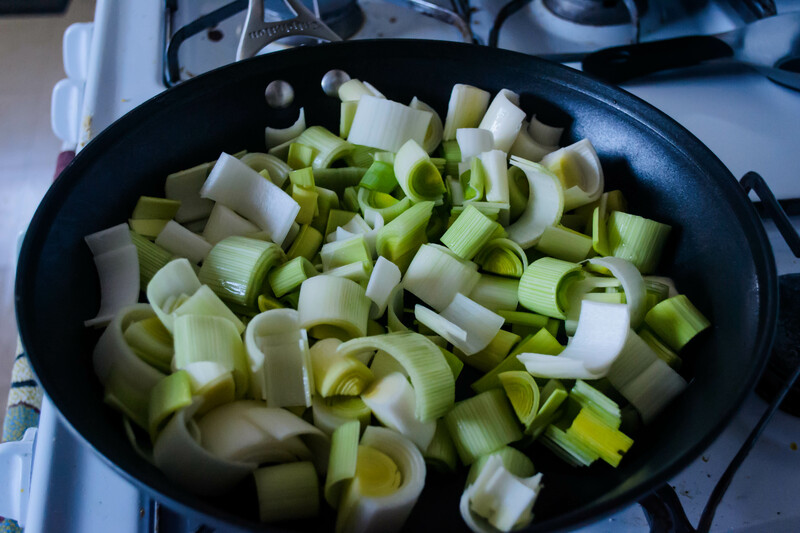 Heat the remaining 2 tablespoons olive oil over medium-high heat in the same large skillet (wipe it out first if there is leek detritus lingering). Gingerly add the meatballs, being sure they don’t touch, and sear until golden-brown on all sides (2-3 minutes for each side); you can do this in batches if necessary. Now, pour on the chicken stock – it should come about halfway up the sides of the meatballs; maybe a bit higher. Add the lemon juice and remaining ½ teaspoon salt. Bring to a boil, then pop on the lid, turn the heat down to medium or medium-low, and simmer gently for 30 minutes. After 30 minutes, remove the lid and cook for a few more minutes, if necessary, until almost all the liquid in the pan has evaporated. Remove the pan from the heat and set it aside to cool. Serve the meatballs just warm or at room temperature, with a dollop of the yogurt and a sprinkle of parsley.